Mr. Varty described the idea of “ubuntu.” It is translated as “I am, because of you,” or in a broader context, “people are not people without other people.” To clarify the concept, he added the thought that “our own well being is deeply tied to the well-being of others.” I needed that at 6 AM on the bike. It helped me to understand the concept much better. As I meet former colleagues at WSJ Society activities, I can’t help but think about the experiences we shared. And, how those experiences helped me along in my career. Some continue to have good impact today. I can recall events with customers and even competitors that helped me grow. They weren’t always pleasant experiences, but the engagements mattered as learning opportunities. It’s not just about those past experiences. The WSJ Society members I meet today are engaged in all kinds of activities that contribute to the well-being of others. Being engaged with others, contributing, makes us better. I think that’s the point of “ubuntu.” Engagement with family, friends, even strangers provides opportunities to contribute. And doing that increases our own feeling of well-being. The concept is simple, but powerful. 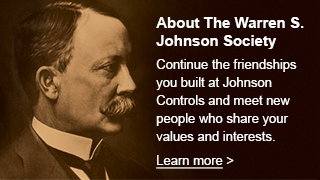 That’s the kind of opportunity that I see in the WSJ Society and WSJSociety.com. We can all be better together! Here’s Boyd Varty’s TED Talk. What do you think?